Friday Follower Freebie Halloween Edition! Some of you may think it's too early for Halloween, but I don't! Not that I've gotten my decorations out yet or have glow in the dark polish on my toes yet, but it's never too soon to think ahead to Halloween, right?!! 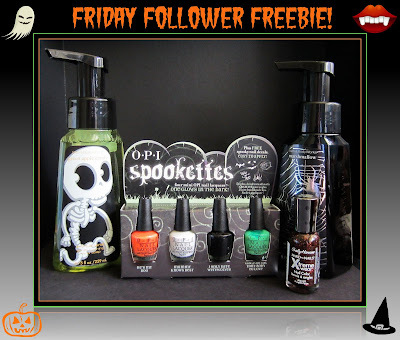 One boo-tiful follower will win OPI's 2011 Halloween Mini Spookettes Collection, which includes their Zom-Body To Love green glow in the dark polish! There's also some spooky nail decals in the kit. The winner will also receive a bottle of Sally Hansen's Pumpkin Spice nail polish, and two of Bath & Body Works newest seasonal hand soaps (Marshmallow and Green Apple Candy). The little skeleton on Green Apple Candy glows in the dark! I'll be posting a similar Halloween giveaway tomorrow on Facebook with some different items, and you're welcome to enter both. If you're not yet a Facebook follower, feel free to click the link on the right. To enter for the prize package shown above, just leave your eMail down below in the comments. I'll accept entries until I post my Come Monday weekly newsletter sometime Monday (8/15) morning. Let us know just how much you love Halloween! Note: VNS has the China Glaze Halloween polishes up! Also, don't forget about Bath & Body Works Paris Amour Launch Event at their stores from 11:00 am to 4:00 pm tomorrow. The flyer I got the last time I went has a coupon for a full sized body lotion in yet another new scent called Charmed Life, and a free cosmetics bag that is only valid during the event tomorrow. Check their Facebook for more details. If you go, check out all of their new Fall hand soaps. You have to give Pumpkin Caramel Latte a sniff...it smells incredible! You'll honestly want to drink it! omggg, i can't wait for halloween!!! love halloween stuff! thank you! Halloween is my favorite holiday! I absolutely love Halloween themed nail polish collections too. Oh, what a great giveaway! LOVE Halloween, and it's never too early! My favorite holiday! Can not wait! Oh wow. I so hope I can win! This is some incredible stuff. those colors look like nfun; great giveaway! Love it! I love Halloween! I can't believe it's already time to think about Halloween! Never too early for Halloween! Dying for the fall to get here so i can start wearing all these colors. This is such a cute giveaway! I love Halloween! I love Halloween! Mostly because it means that it isn't ridiculously hot here anymore, haha. I agree with you. It's never too early for Halloween. I started buying Halloween stuff in July. I'm so excited for all the great Halloween goodies this year! What a neat giveaway!! Thanks! oh those products are to die for !!! It's a shame Halloween isn't a big thing here in Switzerland. Halloween isn't a big thing in Spain either but I love it and can't wait to start using all the cool Halloween polishes!! I love Halloween, its my favorite holiday! Its never too early to think about it! Oooh this is lovely, thank you very much! Great giveaway, it's never too soon to think about Halloween! I'm already thinking about manicures myself, LOL ;) I wish Denmark were more psyched about Halloween, I love Halloween editions! Oh, I love Halloween! Thank you! The best holiday of the year! These are great prizes. Hooray for my FAVORITE time of year, Halloween!! My boyfriend's birthday is on Halloween, so that makes it double fun to celebrate! Ya for an awesome glow-in-the-dark green. Thanks for the giveaway. Yay for Halloween giveaways!!! Thanks! Hmmm, The marshmallow sounds like an interesting scent for a hand soap. I wonder if it smells like the real thing. I can't wait for all the Halloween releases! Please enter me. Love this giveaway :) Thank you! LOVE THIS GIVEAWAY!! Halloween is my favorite and so is beauty essentials! Definately looking forward to the halloween packs! Halloween Already!! Cant complain its my favorite time of the year, cant believe this year has gone by so fast though!! In my opinion, Halloween is the most wonderful time of the year not Christmas! We don't really celebrate Halloween here in Romania, but I love the cool creepiness of it. I only wish we would celebrate it more like you do. I live in Germany and in the smaller towns and villages there is no Halloween at all and in the larger cities children sometimes go trick-or-treating, but not much. The streets and houses and rarely decorated, you see the odd pumpkin around or some fall-stuff, like a wreath made of twigs and plastic-apples and a clay-squirrel and some fake-nuts in it, and that's it. I also love Halloween! Can't wait for it. This is a great set. Thanks. Halloween is my absolute favorite! This is a fantastic giveaway! All the cool stuff comes out during the holidays! I can't wait for Halloween! I love it!!! It's never to early to get excited for Halloween! I usually start after the fourth of July lol. this set is too cute! Could not believe there were 101 comments when I went to post - then I went back and read every word vs. my normal skim reading and saw you were doing a give away - amazing how the comments come out of the woodwork when there is a give away. Halloween collections are so exciting! Definitely not too early to be getting excited for Halloween. I love seeing all the little kiddies out in the scary costumes. Candy corn! and those little pumpkin candies too! Thanks for bringing us Hallowen earlier this year^^ The giveaway looks great! Yeah, Halloween!! We're having such crap weather in France that I can't wait for it to be real Fall, it's my fav season and I adore Halloween!! Thank you so much for this giveaway, my email is darklilith78@gmail.com. Thank you for this GA!! I LOVE Halloween :D The most excellent excuse to wear my more extreme looks and silly dress-ups in the outside world, rather than just having fun with them on my own behind closed curtains ;-) You are never really to old to play dress-up right :D And I love fall colors too! I love decorating for Halloween!! The Halloween candy is already starting to appear in stores. Halloween is my birthday too! When I was a kid people never came to my parties because they were out trick-or-treating. But now people will come to me and ask when my party will be. I love all things Halloween, I cant help it. If I see a display I have to stop and look around. I love little ghosts and pumpkins. Such a great giveaway! I love halloween! Oohh, I love me some glow in the dark polishes! It's NEVER too early for Halloween!!! I already have on Halloween influenced orange nail color!! Awesome! Halloween is one of my favorite holidays! I absolutely love Halloween for the same reason I posted on Facebook--it's not just a holiday for me, it's also my birthday. I used to hate it as a kid but love it now as an adult. Thanks for the giveaways! I LOOOVE Halloween too! The best day of the year to don ridiculous amounts of glitter and those "stripper" heels I've been keeping in the closet for months. HAHA! YAh for this giveaway, it's sick! Love the products Mary! I love Halloween because you get to experience being young and childish again for one whole day or night! I admit that I've only ever been trick-or-treating twice before with my younger sister and I loved it! I got hooked; I love the shopping, decorating and meeting new people, picture-taking and seeing their tricked-out displays! I can't wait for the candy! Thanks! I can never have enough Halloween polishes - love the give away!!! i am lemming this like crazy!! It's never too early for Halloween, lol. Thanks for this great giveaway! Fun Stuff!!! I love Halloween!!! It's my favorite time of year!!! what a fabulous giveaway- I hope I'm not too late to enter! Mmm minis and marshmallow. My favorites! Great giveaway! I love Halloween, and all these look good. Is this closed? I'm not exactly sure.